Per usual, this post will be image heavy. Fair warning! 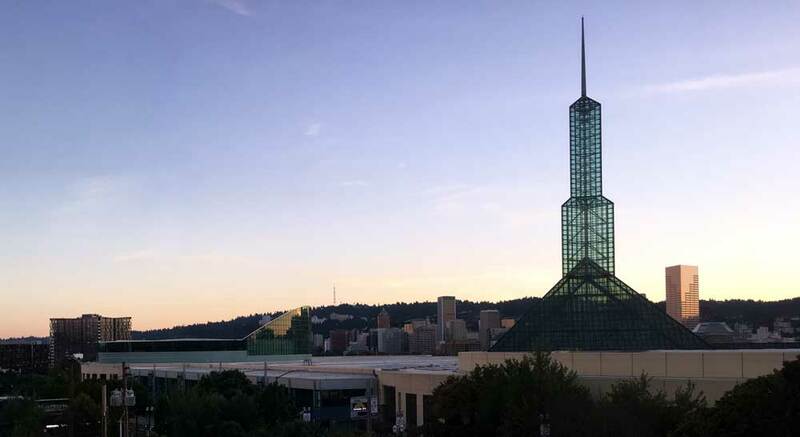 After five days in Portland, it is so good to be home! You know you’re loved when your kitties race to greet you at the door. 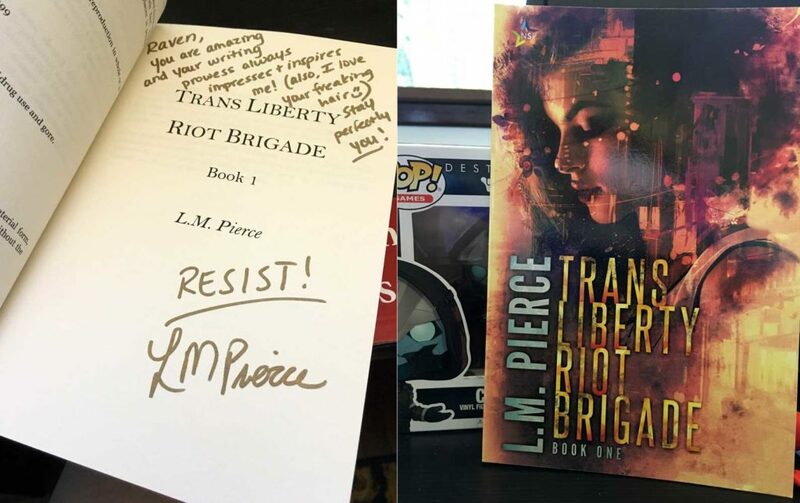 <3 Rose City Comic Con 2017 was a great convention and not just because Books & Chains did well. 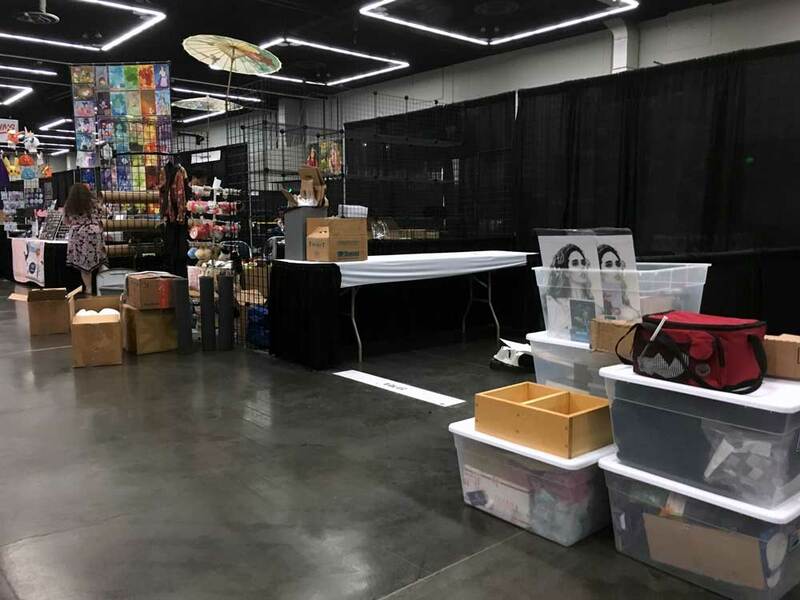 The vendors around us were nice, the cosplay was amazing, the guests were varied and awesome choice-wise, and the convention center was pretty, if a bit maze-like (especially in the parking garage, which requires several different elevators to escape from). 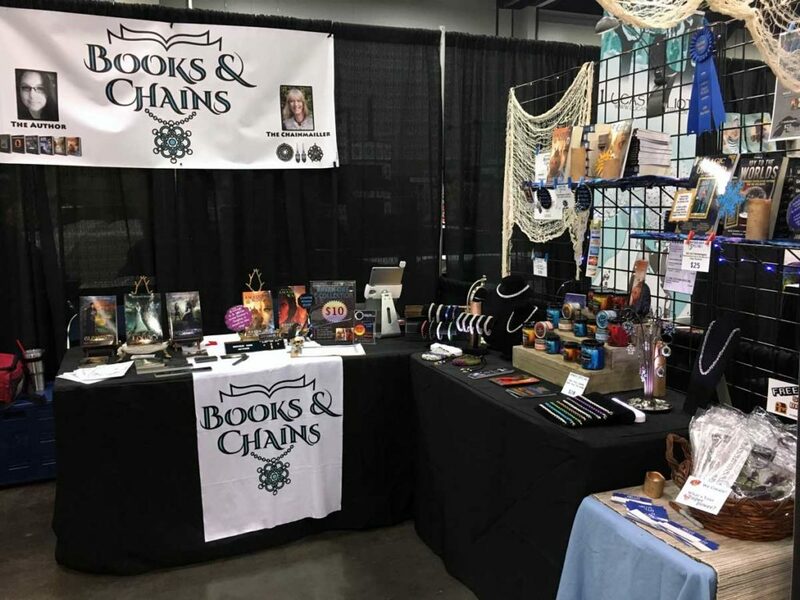 We (meaning Books & Chains, aka me, author Jesikah Sundin, and chainmailler Elise Kreinbring) drove down to Portland Thursday morning for set up, arriving around 3 PM PST. 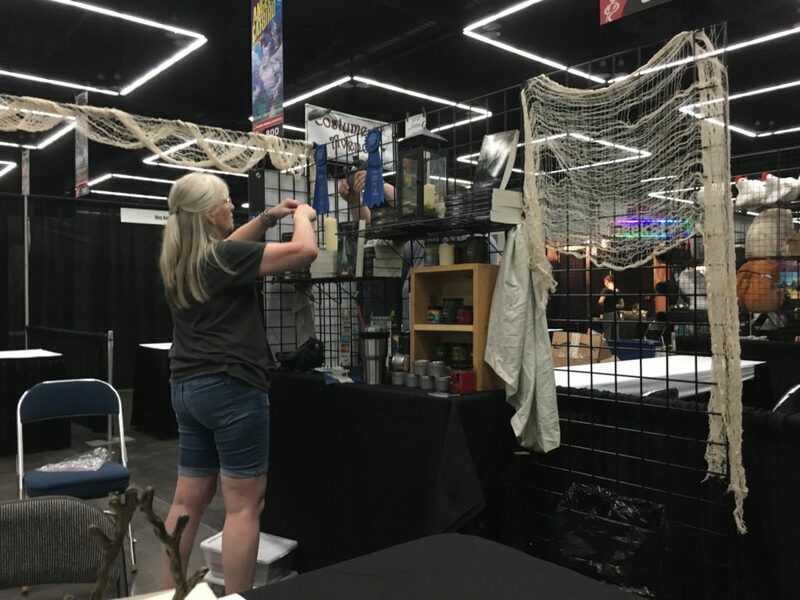 The line to unload was relatively short, and we got to work setting up the booth. 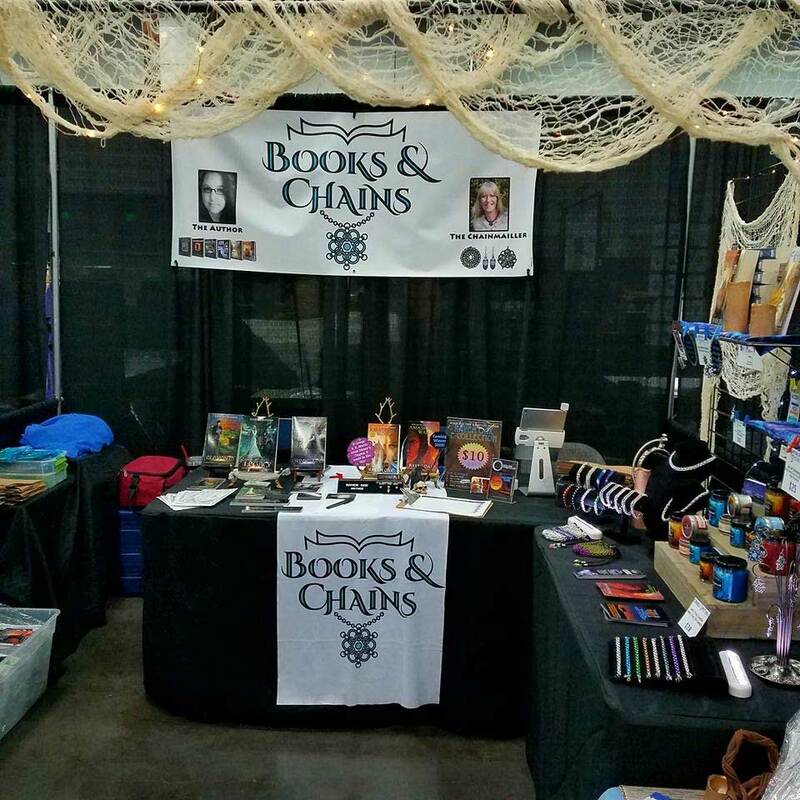 It took a few hours to set up since this was the first time we used this particular layout, but we did it. You can see the fairy lights in the last shot above a bit better. 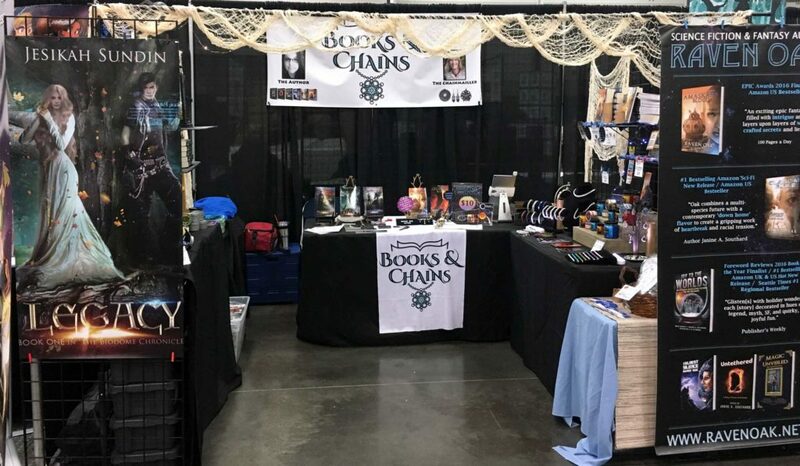 😉 Multiple times throughout the weekend, people commented on how visible our booth was and said we had the “prettiest booth at the con.” Always nice to hear. After set up, we head across the street to the Inn at the Convention Center hotel to check-in, then grab some dinner. After a good dinner a block away at Denny’s, we came back and began stuffing swag bags. 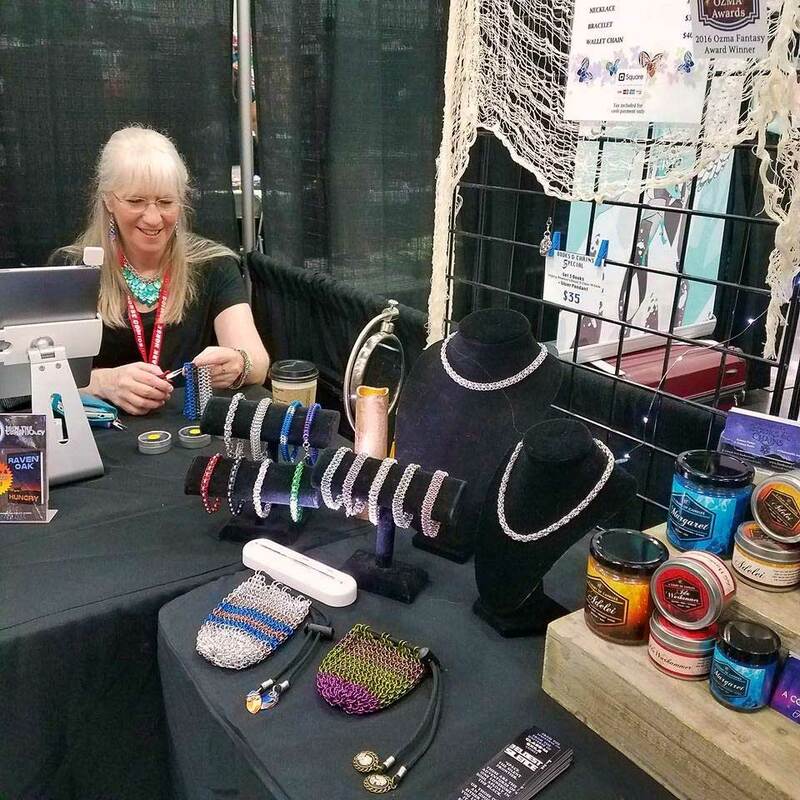 We gave out 300 swag bags full of autographed goodies, coloring pages, and a chainmaille dangle made from maille that was created for NASA’s Mars Insight mission. 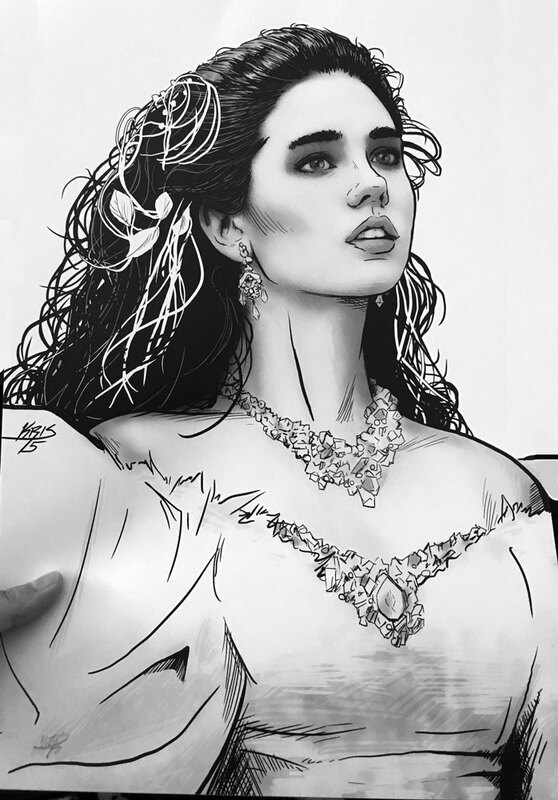 The pieces were highly limited in quantity so those who got one were quite lucky! We also handed out these stickers (seen above) because why not? 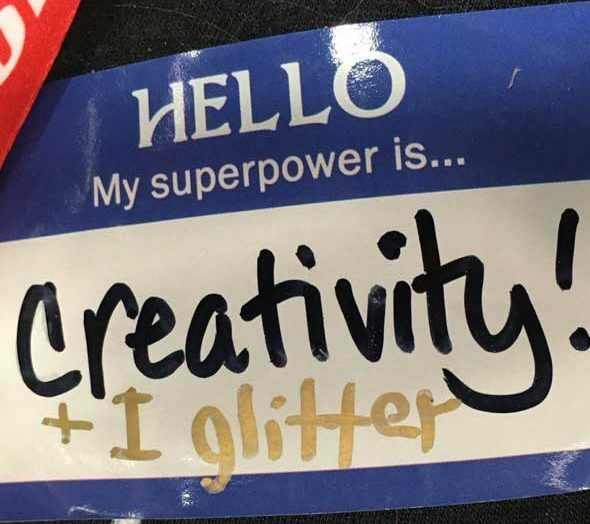 Our superpowers changed daily and were anything from serious (like the above) to goofy, such as “Coffee Obtainer” and “Companion Finder” (from when I was a TARDIS). People were really appreciative of the swag and the stickers. 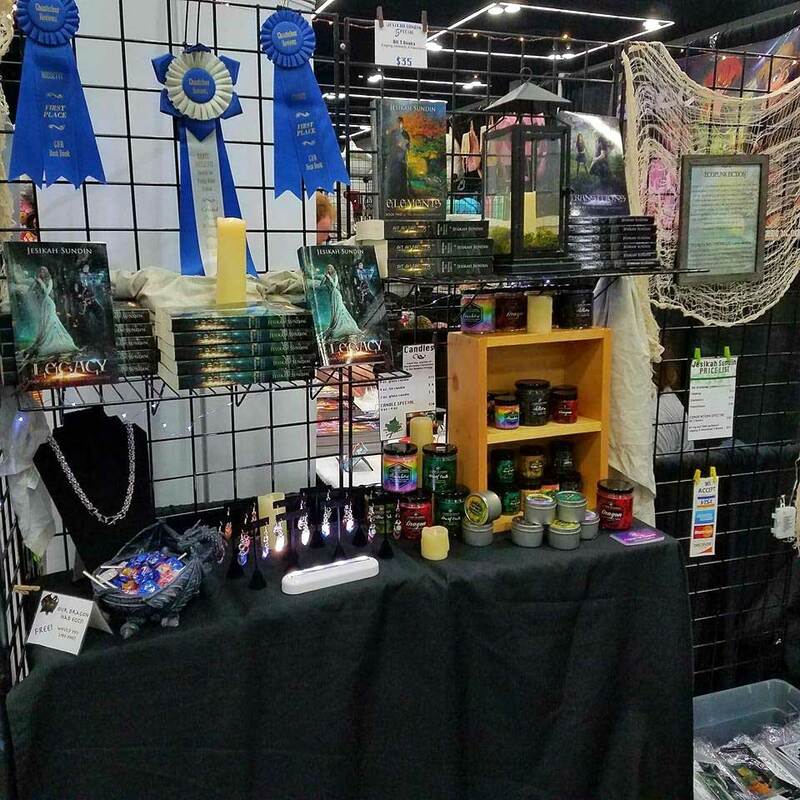 It brought more people to our booth than the “dragon eggs” (aka candy) we had. 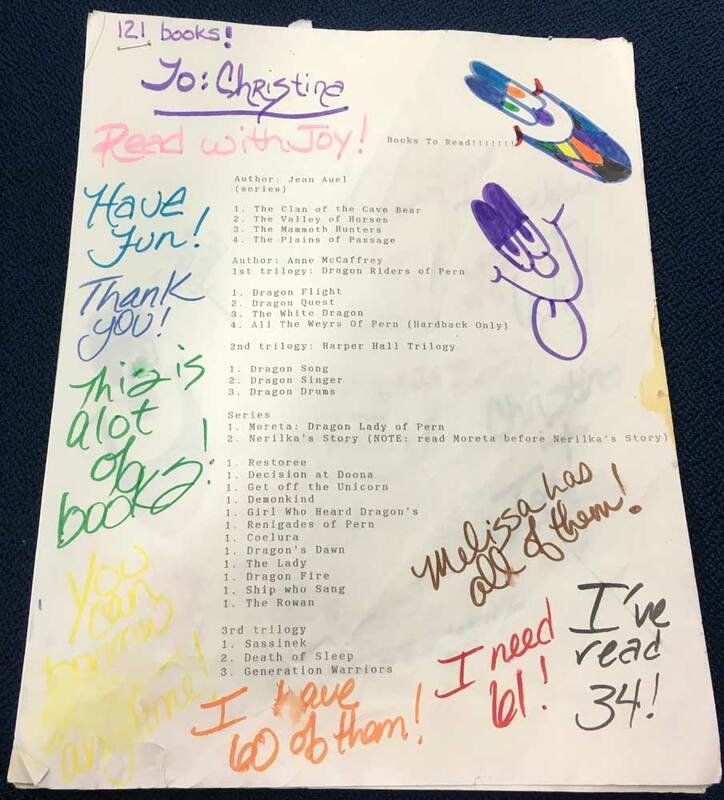 Unfortunately, some juveniles stole some of our sharpie pens and left a few stickers behind where they professed their superpowers were having “big dicks.” The stupidity of their stickers didn’t bug me, but stealing sharpies is a low blow. While we were in our hotel that first night, around midnight when we intended to go to sleep, we discovered our room had bed bugs. Not a ton, but enough that it freaked us out. The hotel moved us to a different, much cleaner smelling room quickly, one that they had searched thoroughly to ensure that it did not have bed bugs. None of us suffered any bites or any further evidence that the bed bugs came with us. 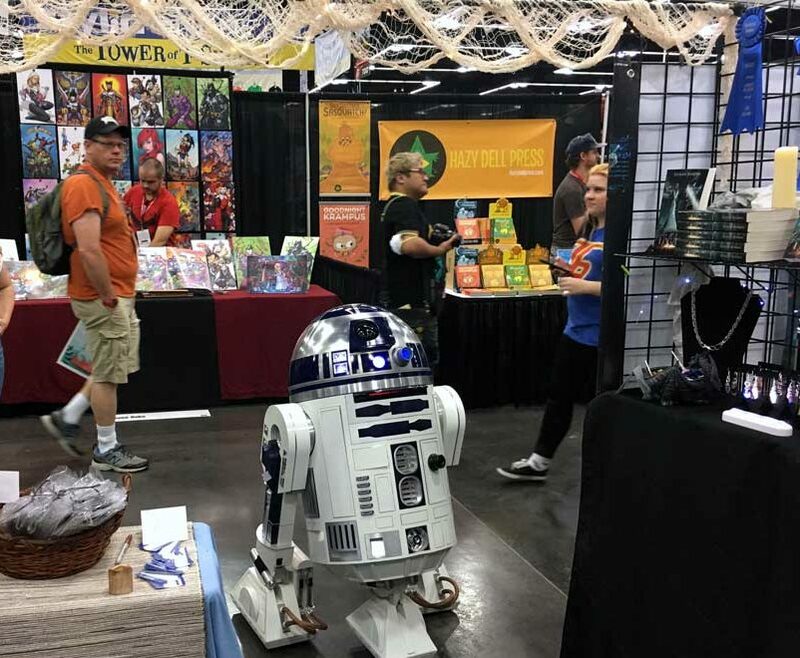 Friday morning, R2D2 paid our booth a visit. 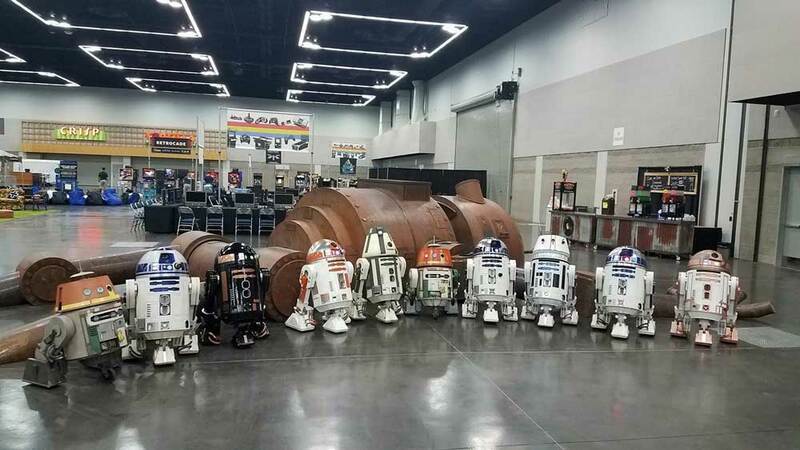 In fact, there was an entire parade of R2 units that went by, which you can watch in the video below. This is a photo Jesikah Sundin took of the whole group paying tribute to the “dead robot” on the con floor. For a Friday, we sold very well. Well enough that most of the time, we were too busy to take photos of the fabulous cosplay around us or each other, though Jesikah did sneak in this ussie. 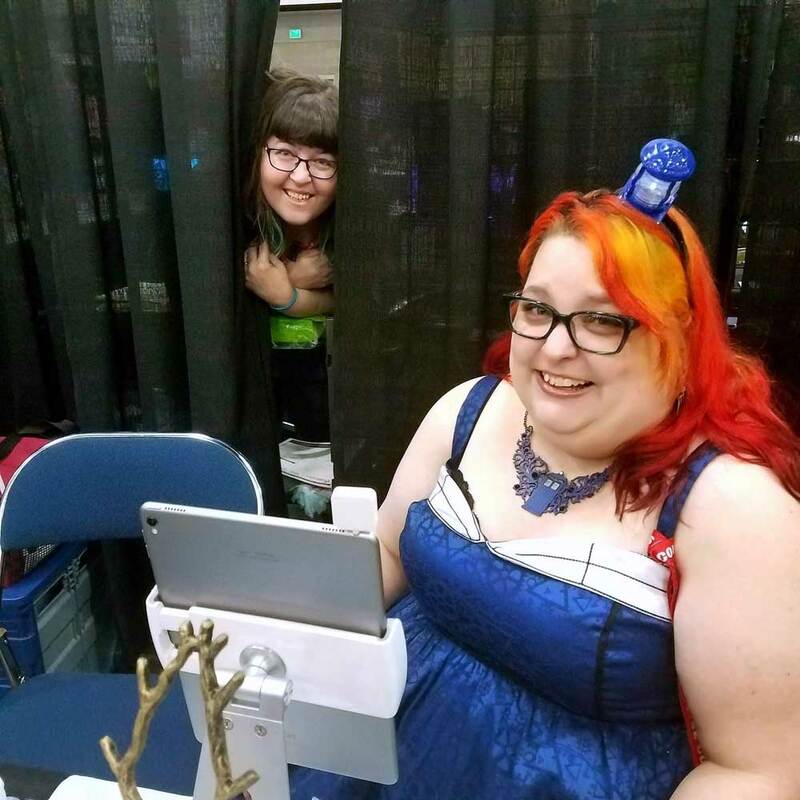 One couple really wanted to purchase the TARDIS dice bag that Elise was working on so they paid for it in advance and kept checking in throughout the weekend to see if it was done (which it was on Sunday). Here’s Elise working on it diligently on Friday. 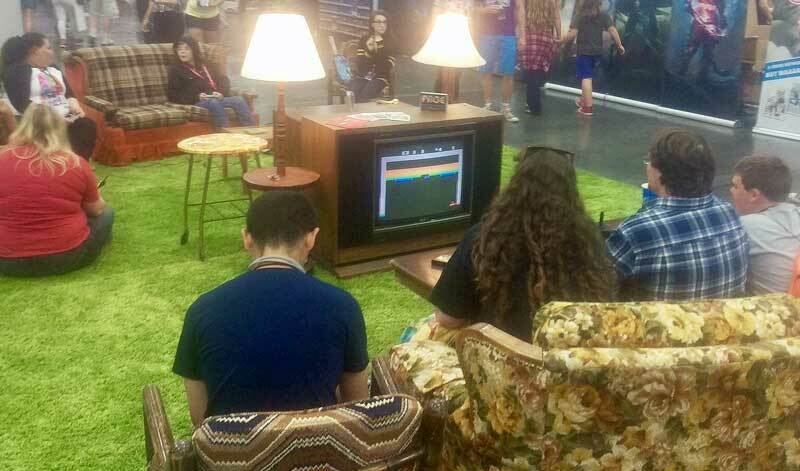 The convention had a really cool retro area set up where families could play old school NES and Atari games in “living rooms” from the proper time period. 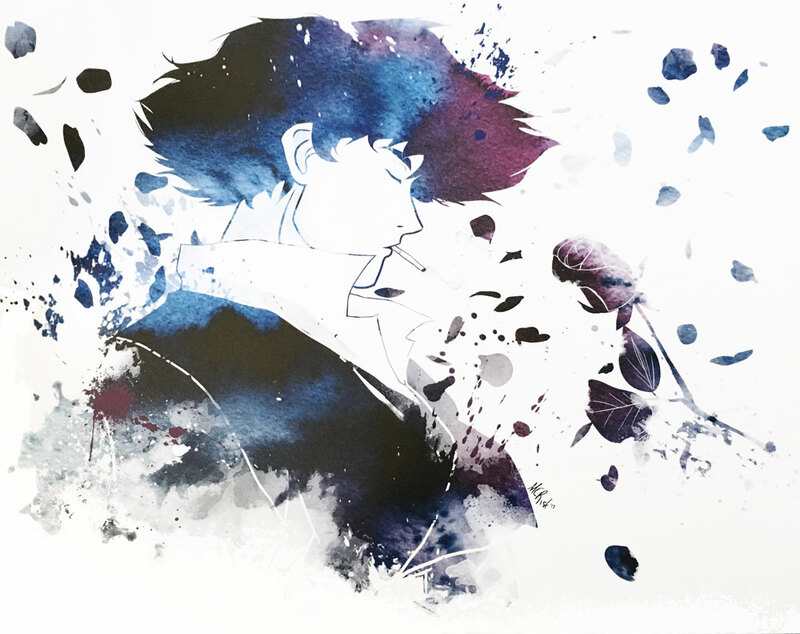 It was pretty cool. I loved the bright green shag carpet. While we never had that, I have fond memories of the huge console TVs my grandmothers had. 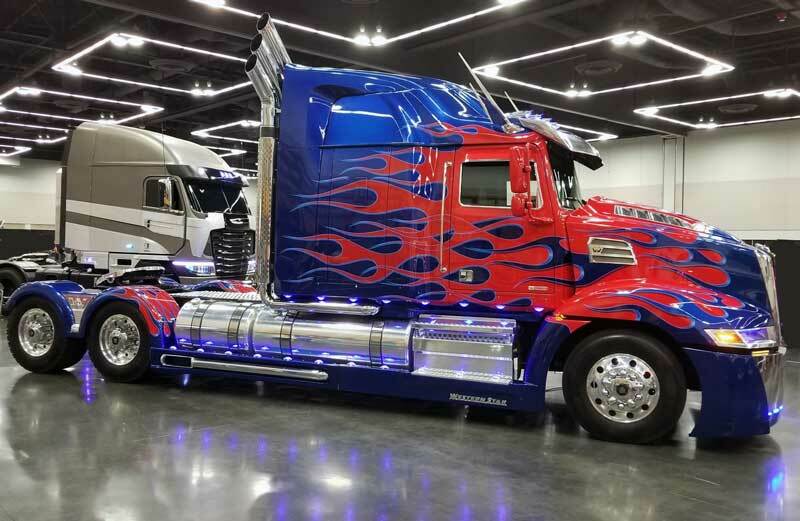 They also had Transformers there. It was crazy. It was really smokey on Thursday and Friday, but Friday evening, it finally rained. 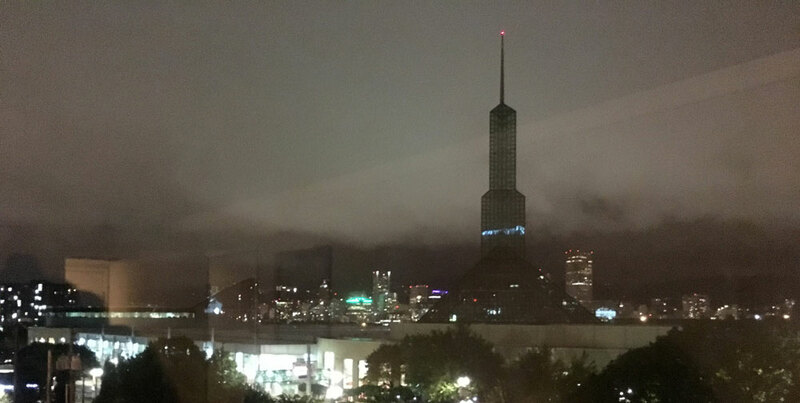 The clouds rolled in, giving us a very post-apocalyptic view from our hotel room. Saturday morning dawned bright and early, and with so many people inside the convention center, the A/C struggled to work at all. Soon, everyone was fanning themselves and complaining about the heat. 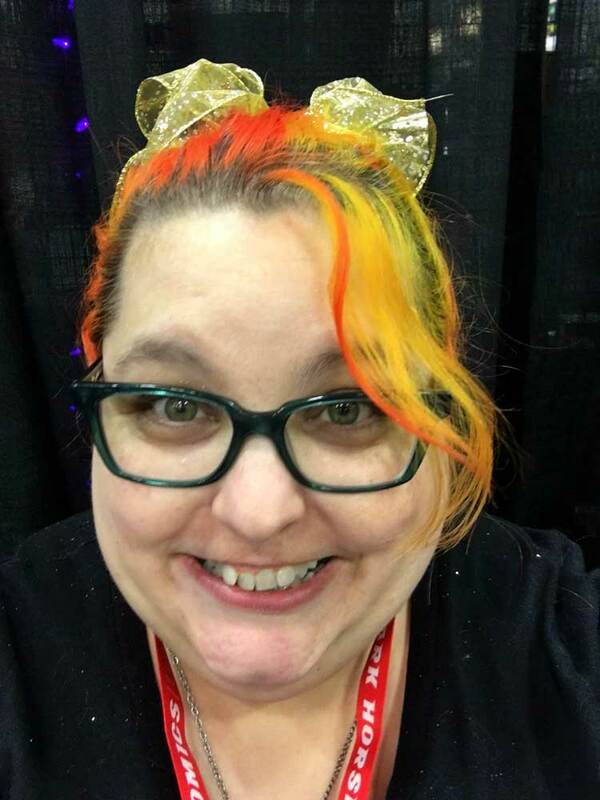 I pulled my hair up with a glittery bow that left me and the booth COVERED in glitter. 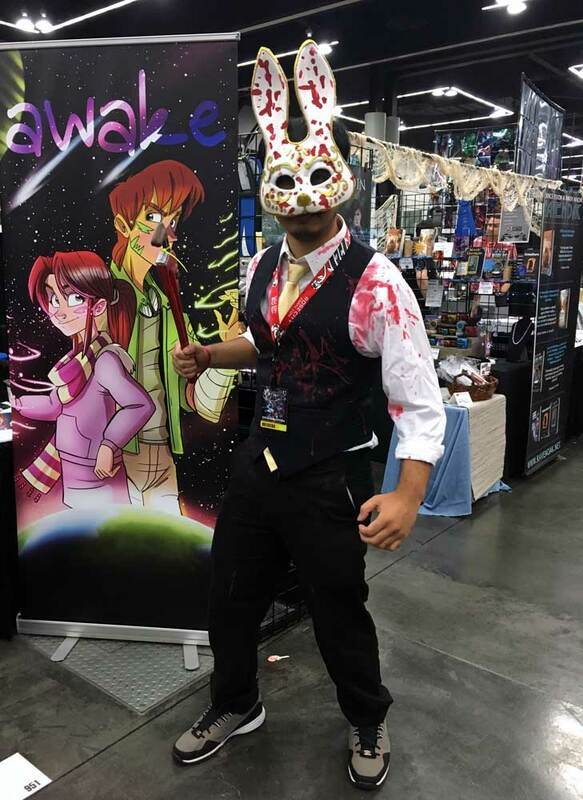 This guy cosplaying a character from Bioshock (one of my favorite games) stopped by, and I took a photo. 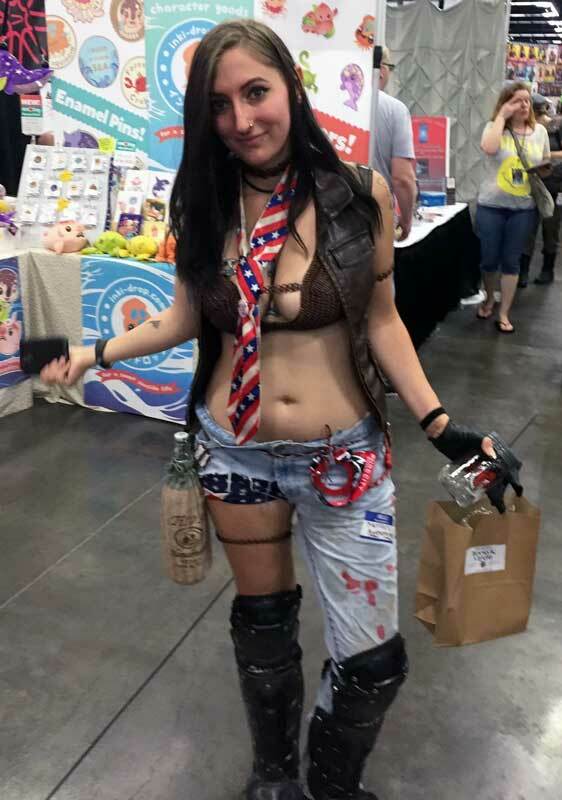 As I said, there was amazing cosplay at this comic con. 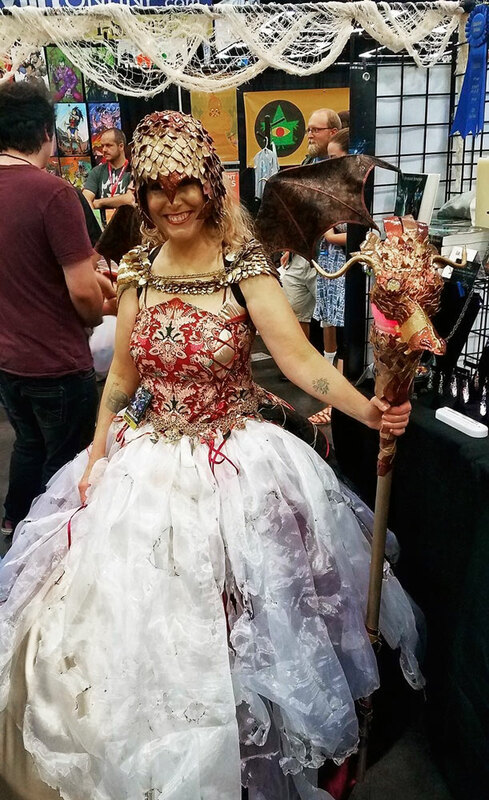 This photo doesn’t begin to show how detailed this woman’s cosplay was. 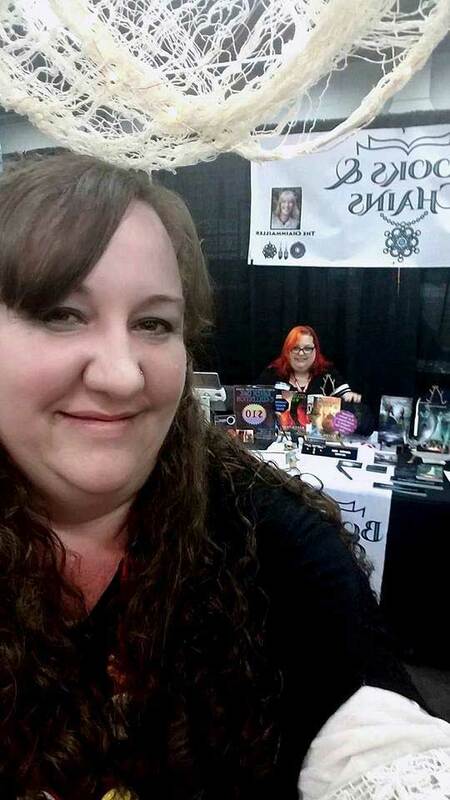 One of the coolest things about this convention is that by sheer luck, our booth was directly behind that of my middle school friend, Christina Fidalgo of Burnt Pixels. There were way too many “Pay no attention to that head in the curtain” jokes throughout the weekend. 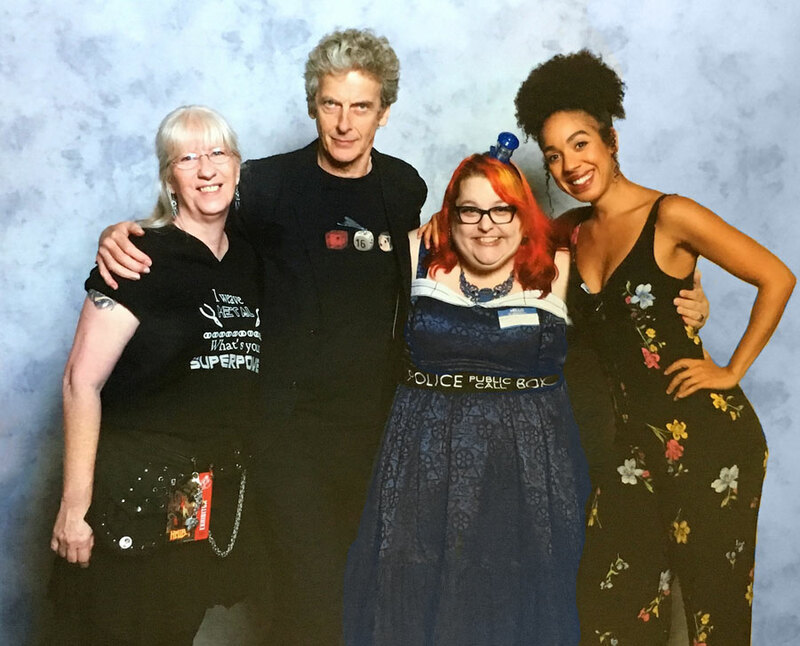 On Sunday, I was a TARDIS because Elise and I had a group photo-op with the most recent Doctor, Peter Capaldi, and his companion, Pearl Mackie (Bill). It was scheduled for 11:45 AM, and both of us were so excited and nervous. We gave both Peter and Pearl the chainmaille dangles with the NASA scales, which is pretty cool. Sunday was a much slower day than we’d anticipated. Usually it’s a mad house due to last minute purchases, but everyone looked exhausted. It was my first chance to go out and do a little shopping as well. 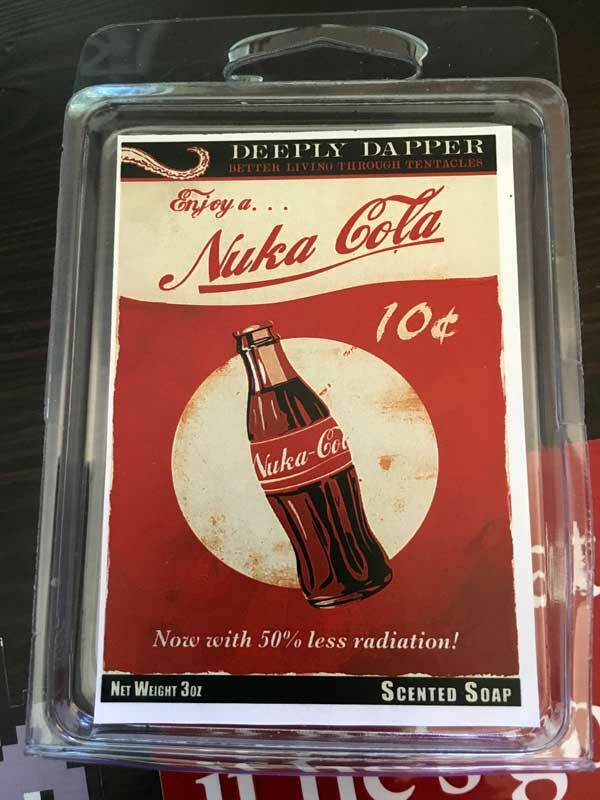 One of my first purchases was this Nuka-Cola soap. I love everything Fallout, so this was a great find. It really does smell like soda. 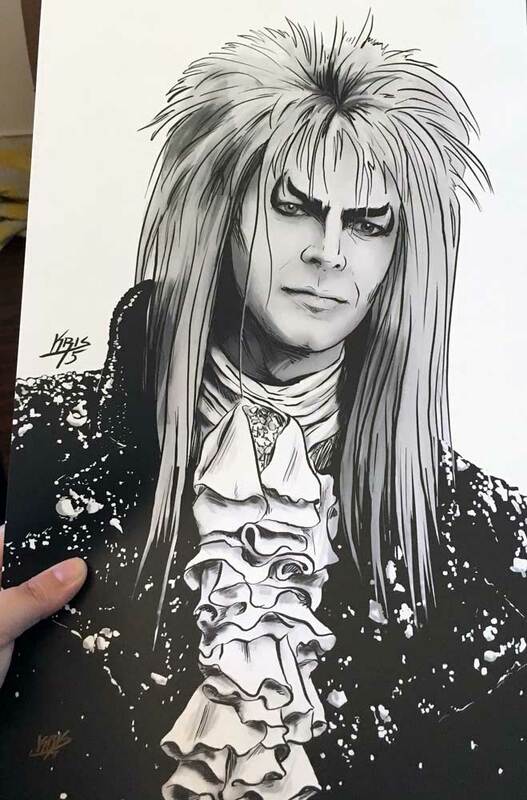 One of the artists down the aisle from us had some amazing artwork, which included some from Labyrinth. One of our customers who bought books from Jesikah and I had purchased it the day before, which I saw when she came into our booth. There was way too much good art in this place! 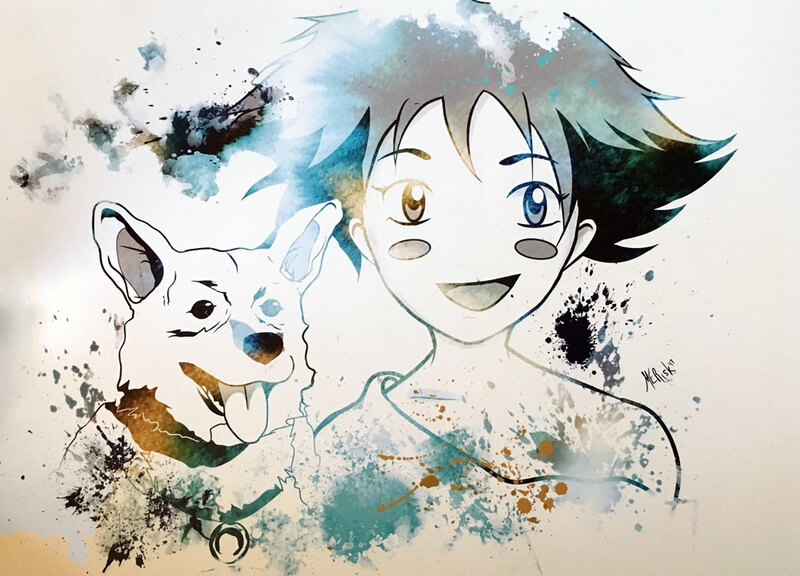 Here’s the Cowboy Bebop art of Ed and Ein, and Spike, my favorite characters. Oh! 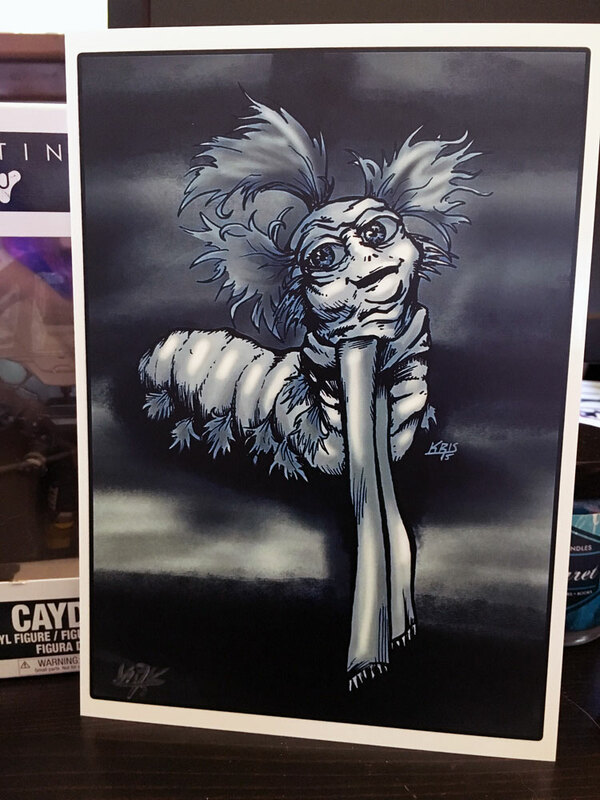 I almost forgot–I got an art piece of the worm from Labyrinth as a bonus when I bought Jareth and Sarah. All too soon Sunday was done and it was time to pack up and tear down the booth. 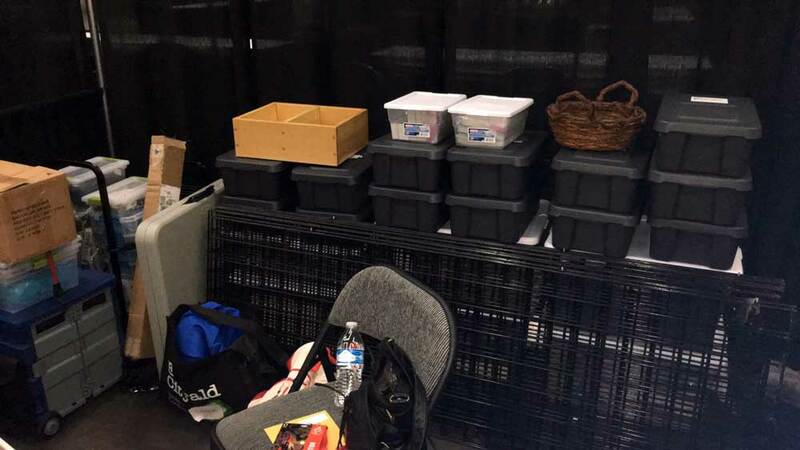 There was a LOT less to pack up this time since we did so well sales wise. Many of my book crates were empty or nearly so.